MONTEVIDEO, Aug 28 2012 (IPS) - Uruguay needs to reinforce and expand its electric power grid to absorb the 1,200 megawatts of wind energy that it plans to generate by 2015. This wind power target forms part of a larger goal for the same year: to generate half of the energy consumed in the country from renewable sources. Investment in the production of wind energy is undergoing a major boom. And as a result, the state-owned electric power company, UTE, is faced with the need to improve Uruguay’s power transmission infrastructure. At the moment, wind energy contributes only one percent of the small South American nation’s electricity, with three wind farms that generate a total of 43 megawatts in the southeast: one publicly owned farm in the department (province) of Maldonado and two privately owned facilities in the department of Rocha. When the 1,200 megawatt target is met, wind energy will account for 29 percent of the electricity supply, UTE chairman Gonzalo Casaravilla told Tierramérica*. Six contracts have already been signed and 12 more will be signed soon for the generation of 930 megawatts in facilities to be installed over the next few years, reported Casaravilla. These ambitious plans encompass 21 new wind farms in 11 departments in the northwest, west, centre, south and southeast of the country. According to Casaravilla, construction of these new facilities will begin at the end of the year and be completed in 12 to 18 months. In addition, UTE plans to generate another 180 megawatts through an agreement with the Brazilian state-owned electric power company, Eletrobras. While the entire country offers good wind energy potential, the density of its electricity grid is not as homogeneous. “The grid was designed many years ago to take electricity to where the people are, not to bring electricity from those places,” explained the director of the National Energy Office at the Ministry of Industry, Energy and Mining (MIEM), Ramón Méndez. Uruguay has the highest rate of electrification among all the countries of Latin America, with 98.8 percent service coverage. But with a population of just under 3.3 million people and almost half of them concentrated in the capital, Montevideo, there are large stretches of very sparsely populated areas. In these areas, “the electric power lines are designed solely to satisfy the needs of those few customers,” said Méndez. And when big wind farms are installed, “much longer lines are needed to connect to a sufficiently powerful first node to discharge all of that energy,” he added. This has turned out to be the main challenge. “In the beginning it was easy because there was room everywhere, but as distributed generation gradually became denser, it became more difficult to select appropriate locations,” explained Casaravilla. 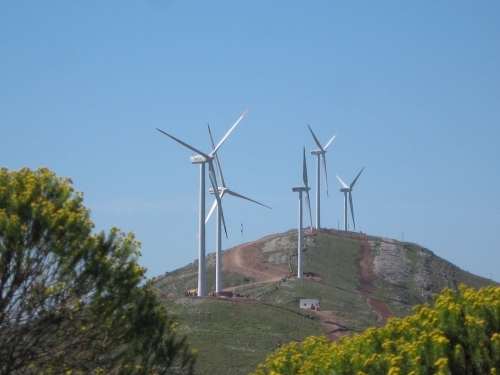 Two of the 18 wind farm projects proposed and approved faced difficulties in connecting to existing networks in the sites originally chosen, in the departments of Tacuarembó and Florida. But both were relocated to areas with better connections, he noted. “We have managed to find locations for all of the projects for which bids were presented in the tender held by UTE. There were really very few places remaining with leftover capacity,” he added. As a result, UTE plans to develop the power grid infrastructure needed for the installation of new wind energy facilities in the next ten years. “We have plans to expand the grid in the north, to make it possible to continue incorporating distributed generation in accordance with the demand,” said Casaravilla. Over the next five years, around one billion dollars will be invested in power lines and substations. Right now, however, six companies want to build eight wind farms in Pueblo Peralta, in the northern department of Tacuarembó. This would involve a total investment of 20 million dollars, which would allow for the generation of 300 megawatts in an area “with excellent wind potential,” Ricardo Pretz, the director of one of the companies, PTZ Bioenergía Uruguay, told Tierramérica. The winds in this site “will make it possible to install wind turbines with much longer blades, to produce more energy. The result will be much more profitable projects, allowing UTE to buy the electricity at lower prices,” argued Pretz, whose company forms part of the Brazilian group PTZ Bioenergy. Unfortunately, in this particular area of the country “there are no possibilities of connection to the grid, because the closest substation is saturated,” he said. The companies are determined to stick with this location, however, and have met with Casaravilla and Energy Minister Roberto Kreimerman for this purpose. Casaravilla said that “today we cannot offer a solution, because we need to see how the contracts already signed develop.” The country will need to continue installing wind farms after 2015 “and we will have to study the best way to do it,” he added. For each tender held, around 20 projects have been proposed through various international companies. “Contracts are negotiated for periods of 20 years, and thanks to this boom in the market, we have managed to obtain very good prices, 50 percent below average prices in Europe,” he said. This results in costs of “around 60 dollars per megawatt-hour, with no subsidies of any kind, which is a key issue,” he stressed. These investments will make it possible to reduce the country’s electricity costs by an estimated 30 percent by 2015, he added. Uruguay’s current energy policy was adopted in 2008 for the next 25 years; in 2010 it was endorsed by all of the country’s political parties. The changes began in the electricity sector with the first incorporations of wind energy (in 2008 there was a single turbine) and the large-scale incorporation of biomass, said Méndez. “In a short time we achieved very significant change, given that we ended last year with a 46 percent share of renewable sources in the energy mix as a whole,” he reported. Hydroelectricity accounts for 20 percent, waste biomass represents 12 percent, firewood makes up another 12 percent, and the remaining two percent is contributed by biofuels, solar power and wind energy. Achieving a 50 percent share of renewable sources by 2015 is an “extremely ambitious” target, said Méndez, since renewable energies currently account for less than 12 percent of the global energy mix. The development of renewable energy is key for a country that has no hydrocarbon production and depends on imported crude oil for its fuel supply. In this area as well, however, there are an increasing number of international companies exploring for oil and natural gas in different geological formations in Uruguay.